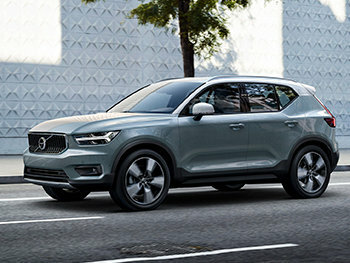 Lease a 2019 Volvo XC40 T5 Momentum (V19139) from $279 bi-weekly at 3.9% for 48 months with $2,300 down. *Limited time lease offer available through Volvo Car Canada Limited, on approved credit. Representative lease offer based on a new and previously unregistered 2019 Volvo XC40 T5 Momentum (V19139). 3.9% lease APR for 48 months. Bi-weekly payment is $279 and includes $2,015 freight and PDI; $100 A/C charge; up to $495 retailer administration fee; as well as all other applicable fees, levies and duties (all of which may vary by retailer). 104 bi-weekly payments required. License; insurance; registration; and applicable taxes are extra. $2,890 due at lease inception. Total lease obligation is $31,906. 12,000-kilometer allowance per year; charge of $0.16/km for excess kilometers. Advertised offers are applicable in British Columbia only. The retailer may lease for less. Retailer order/trade may be necessary (but may not be available in all cases). Conditions apply. Offer ends February 28, 2019 and is subject to change or cancellation without notice. European models may be shown. Features, specifications, and equipment may vary in Canada. Visit volvocars.ca for more information on Canadian models and features. © 2019 Volvo Car Canada Ltd, 9130 Leslie St., Suite 101, Richmond Hill, ON L4B 0B9. Always remember to wear your seat belt.